Eero Saarinen, M.I.T. Chapel, 1949-55, Cambridge, MA. Photo: Margaret M. Grubiak. This book, the first in-depth study of religious architecture on the American campus, argues that the architecture of the American campus visualized the shifting and ultimately declining role of religion within the mission of the modern American university. University leaders used architecture in an attempt to retain religion within an increasingly scientific and secular university. Large-scale, neo-Gothic chapels advertised religion's continued role and appealed to students' emotions, and cathedral-like libraries re-imagined a place for religion on campus. Yet despite these optimistic attempts to reframe religion for the modern university, religious architecture on the campus declined. 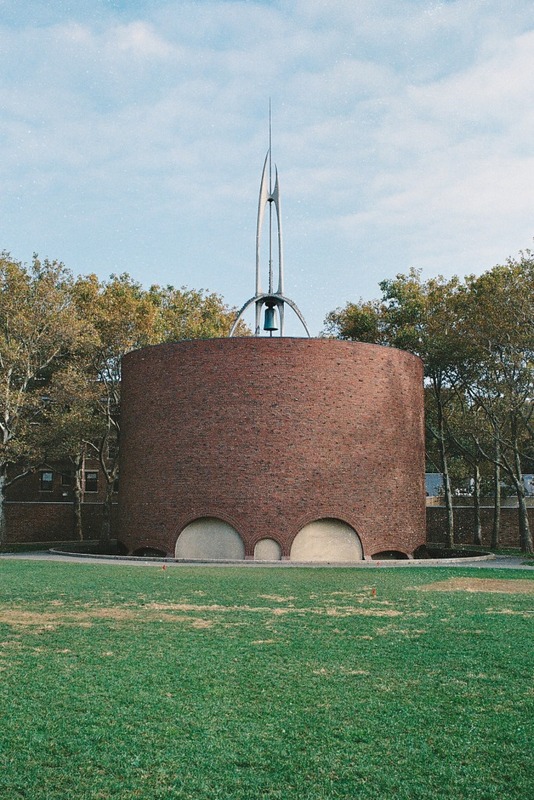 Postwar university chapels projected a different image in their small scale and nondenominational focus. By the 1960s, religious buildings on campus did become white elephants—monumental structures that stood outside the central concerns of American higher education. Margaret M. Grubiak is an assistant professor of architectural history in the Department of Humanities at Villanova University. Grubiak completed her PhD and MA in architectural history at the University of Virginia, and she specializes in nineteenth- and twentieth-century American architecture. Her research explores the intersection of architecture, higher education, and religion. Her publications include articles on Yale's Neo-Gothic Sterling Memorial Library as an alternative religious architecture on campus; the real intention of the University of Notre Dame's "Touchdown Jesus" mural; and the Danforth Chapel program on public universities across the United States. Her forthcoming book White Elephants on Campus: The Decline of the University Chapel in America, 1920–1960 (University of Notre Dame Press, 2014), is an interdisciplinary examination of the changing role of religion in higher education through the architecture and planning of the American campus.